I’m a fan of weeds and wine, as you well may know. I’m particularly a fan of foraging wild weeds and invasive plants for herbal remedies, brews, and medicines. Goldenrod is a lovely and yet often misunderstood plant. Many people blame their autumnal allergies on the showy, yellow flowers, but I can promise you that goldenrod is not the culprit! Ragweed is another plant that grows near goldenrod, and the ragweed flowers are green and easily overlooked – that’s the one that makes allergy sufferers sniffly! Goldenrod is one of those cures that grows next to the problem – like jewelweed and poison ivy patches – it’s a great boon for allergy symptoms! I’ve written about its herbal uses if you want to know more, and I’ve also penned a poem about harvesting goldenrod. 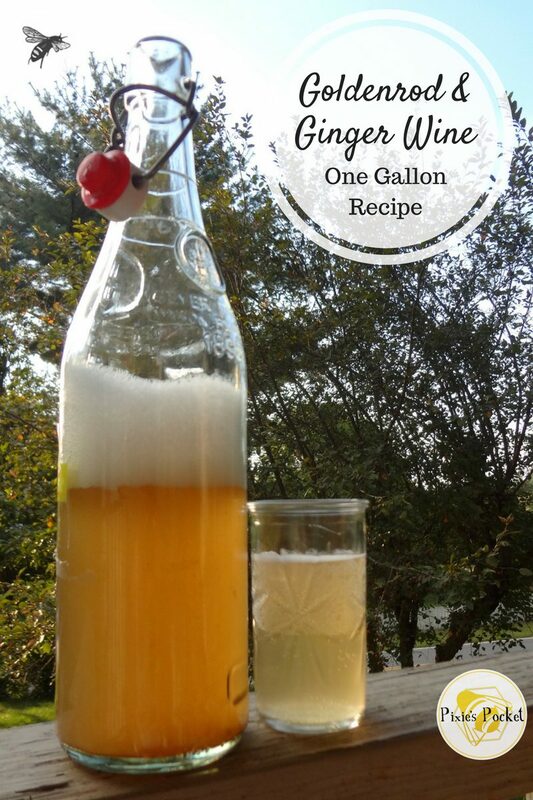 This recipe and procedure assume that you have the basic equipment and knowledge for how to brew a gallon of wine or mead. Need help? I have a few great reference books on brewing listed here, and a guide to brewing here. If you want to delve into other recipes for brews made with foraged wild plants, check out my e-book, Forage & Brew! 2. Prepare the flowers! If you have a muslin bag or cheesecloth, add the goldenrod to it. If not, you’ll need a strainer when you pour the mixture into the carboy later. You could also simply leave the flowers in your brew if you don’t mind floaty bits to clean out of your carboy after bottling. It’s up to you! 3. Remove the boiling water from heat and add the goldenrod, raisins, lemon juice and tea. Give it all a stir and then cover the pot and let it sit for about 15 minutes, or until it is a bit cooled off. If you have the goldenrod flowers in a muslin bag, you can now remove them and squeeze out all of the liquid back into the pot. 3. Pour your sugar or honey into the warm tea and stir to dissolve. 4. Once the pot is cool enough to handle and the liquid safe to pour, strain the tea into the sanitized carboy and top it off with the rest of the clean water to the neck. Add the bung and airlock to the jug. 6. When the bubbles stop and the liquid is clear, it is time to bottle! I used swing-top bottles for this brew, which are better for short-term aging. If you want to age the wine for longer than a year, use corked bottles instead. This golden-white brew ends up tasting like a dry white wine with citrus overtones. In my experience, the longer it aged, the more active it became. I made my first batch of goldenrod wine in 2013, bottled it in January 2014, and we just opened the very last bottle in August of 2016. It was VERY ACTIVE as you can see in the image below. Just look at the head in that bottle! The more bubbles, the more head, the more yeast activity you have, the less sweet your brew. We added some sugar syrup to this last bottle to make it the flavor come out, and it was delicious! ← Homespun Seasonal Living’s “Herbal Cookery E-Course” Now Enrolling! I LOVE this! It’s like kombucha with an extra kick! 🙂 Savings, thank you. Thank you, Michelle! I appreciate your comment and sharing as well….we’ll just have to suffice by clinking virtual glasses from afar! <3 Cheers! Definitely making this. We have so much goldenrod this year, I was thinking of drying some to make winter drinks. This fits the bill for any season! I also dry goldenrod, it’s pretty nice to add into teas, but it seems to often lose it’s citrus-like flavor after a few months. 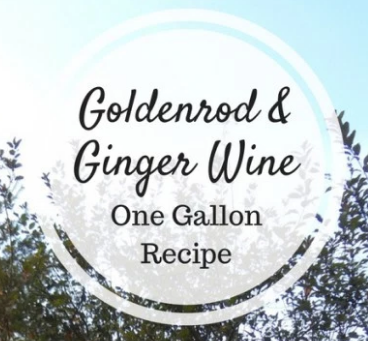 I hope you enjoy the wine recipe! What a lovely looking drink! Who would have thought you could make it out of goldenrod. So I’m at the point that it has stopped bubbling and I have it bottled in swing top bottles so it can age for a year. I tasted what I used to test the alcohol content with the hydrometer and it’s very bitter 🙁 I know it hasn’t aged and isn’t ready yet… but I don’t imagine that bitterness will go away! Any advice? Do you think I did something wrong for it to be so bitter? I wanted to add that it looks and smells beautiful! It actually tastes very unique and good until it hits the back of my tongue… I see that you said you added simple syrup to yours when it was finished. Maybe some time and if needed a little sugar will do the trick! The bitterness just might go away, you’d be surprised! How long was it in the jug before it stopped bubbling, and what did the hydrometer say? Sometimes, time and a bit of sweetness helps quite a lot. 🙂 Honey syrup, or sugar syrup, saves a lot of dry brews for me, since I’m pretty hands-off on my brews.